This detached Victorian four star graded self catering spacious accommodation is set within its own grounds with ample parking. These charming apartments offer comfort combined with cleanliness to ensure you have a most enjoyable stay. There is a guest garden for you to enjoy, with tables and chairs, as well as a useful drying area. The Parterre is ideally located within easy walking distance for all the amenities Sandown has to offer and is the perfect base to explore and enjoy the beautiful scenery and facilities of the island. 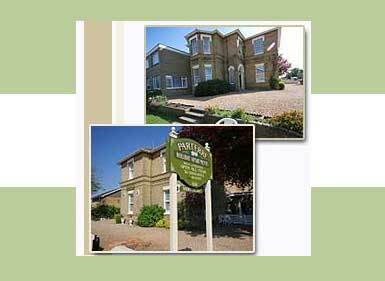 Parterre Holiday Apartments are open all year, offering short breaks from October to Easter. Once you board the ferry of your choice to bring you across the Solent, your Isle of Wight experience begins. After arriving on the island you will find the resort of Sandown on the sandy south east coast of the Island. Sandown bay has award winning blue flag beaches, its very own pier, lovely esplanade, the Heights Leisure Centre, local train and bus services. You may find Ferncliff and Battery Gardens from which you can enjoy coastal walks along the cliff path towards Shanklin where you can take in breathless sea-views of the Bay from the various seating areas. Sandown bay has a beautiful large award winning safe sandy beach with various water-sports, its very own pier with entertainment for all ages, including café & bar, young children’s fair-ground attractions and sea fishing. Along the esplanade and in the High Street you will find bars, restaurants and tea rooms. Go-karts, crazy golf, pitch & putt, trampolines can be found within Sandham Gardens adjacent to the sea front. The Isle of Wight Tiger Sanctuary, Dinosaur Isle for those geologists are located further along the sea front as well as Yaverland's beach which host the very popular up and coming extreme sporting events. For those of you who feel energetic take the opportunity to use the Heights Leisure Centre, which is only a few minutes walk away from the Parterre. Its facilities include Gym, Sauna & Spa rooms, fitness classes, indoor swimming pools, hairdressing, bar and poolside café. The Sandown Bay Open Top Tour Bus is an ideal form of transport for commuting around the bay.